The Firstlaw Fitness I-Beam Pull Up Bar is the only one that uses 1-1/4" diameter steel tubing. This makes it the strongest one on the market. Don't be fooled by other I-Beam Pull Up Bars that claim to use 1-1/4" steel tubing but ship 1.0" steel tubing. We are proud to supply the United States Navy with our I-Beam Pull Up Bars (see product images). The United States Military has strict guidelines for strength and durability, which our product had no trouble meeting. The I-Beam Pull Up Bar is easy to install in 15 minutes or less, no drilling required. The unique design uses (6) bolts to clamp to the bottom flange of the I-Beam. Once installed it feels like the Pull Up Bar is welded to the I-Beam. It comes with foam rubber grips that give you 3 different pull up variations (wide, close, and pistol grip). These different variations isolate different muscles giving you a more complete workout. The Firstlaw Fitness I-Beam Pull Up Bar is engineered to last. It comes with a LIFETIME WARRANTY and is 100% made in the USA. 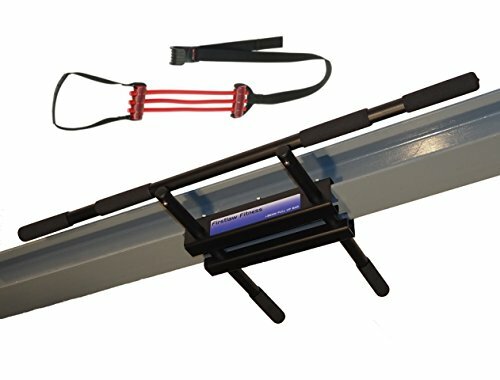 If you have access to a steel I-beam you have to try the Firstlaw Fitness I-Beam Pull Up Bar. If you are not 100% satisfied with this product return it for a full refund, no questions asked. Please contact Firstlaw Fitness with any questions through Amazon or direct from our website.